In the fast-paced world of health care clinical effectiveness relies not only upon medical, but also administrative competence. This issue of Neurologic Clinics features 14 articles from experts in their respective areas of office management. 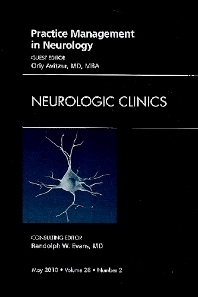 Articles include practice and compensation models; negotiating with payers; using benchmarks; web based neurology resources (clinical); web based neurology resources (practice management); use of electronic health records in neurology practice; hot topics in risk management; HIPPA and other regulatory issues; ethical issues; new concepts in residency and fellowship training; using evidence based medicine; P4P and PQRI; patient education; and the future of neurology.